The construction industry and the Australian Engineered Fasteners and Anchors Council (AEFAC) have developed a new standard for concrete anchoring which is to be referenced within the next revision of the National Construction Code (NCC) scheduled for release in May. The new standard, named “SA TS 101:2015 Design of post-installed and cast-in fastenings for us in concrete”, covers post installed chemical anchors, mechanical anchors and cast-in anchor channel used in concrete for all safety-critical applications. The standard is based upon European design guidelines (ETAG) and ETA product assessment as the method of compliance under the Deemed to Satisfy (DTS) provisions of the NCC. Designers will have a consistent design approach and comparable product assessments to facilitate efficient and effective designs. 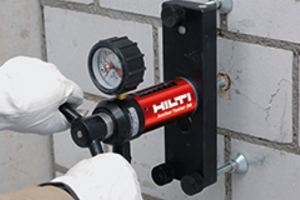 Hilti, the global leader of value-added, top quality products and services for professional customers in the construction and building maintenance industry, has been a vocal supporter of these design principles and product assessment methods for a long time. Zoran Skoric, head of Engineering – Hilti Australia, said the adoption of these principles and methods ensure an appropriate anchoring solution and most importantly, a safe structure. “The objective of having SA TS 101:2015 published has been to raise safety and quality standards in the Australian anchor industry and make the industry a safer one,” Mr Skoric said. Hilti anchors are already ETA assessed and the design software PROFIS Anchor and PROFIS Channel are compliant with SA TS 101:2015. Technical support staff, qualified engineers and online resources are also available to deal with all your design and construction queries. Professor Emad Gad, Chairman of the AEFAC Board, said the Council was very pleased that the new standard has been published, adding that the implementation of best international practices marks a significant development for the Australian construction industry. “We now have consist and robust means of prequalification and design of anchors for safety critical applications. Furthermore, the standard has just been referenced in the 2016 National Construction Code (NCC), which gives designers the assurance of deemed to satisfy provisions,” Mr Gad said.